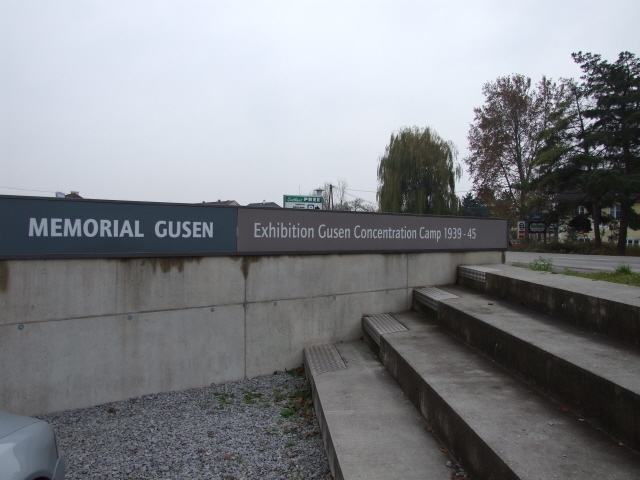 Gusen was nominally a satellite camp of Mauthausen concentration camp in Austria, though it eventually was even larger than the main camp. Today, very little of the camp's original buildings/ structures remain or are visitable – except for a recently added small visitor centre next to the memorial at the camp's crematorium. 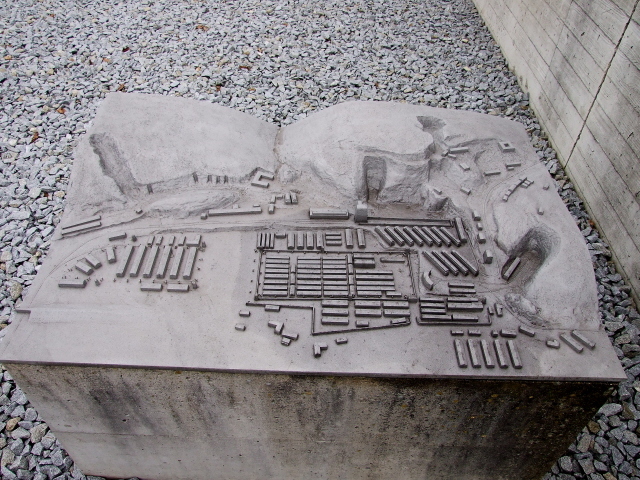 More background info: Even before the camp at Gusen was set up, inmates from the nearby Mauthausen concentration camp were marched to work in the quarry here. From late 1939 the first camp at Gusen proper was built and opened in May 1940. Up until about mid-1943, the work at the quarry remained the main form of forced labour for the inmates. Then, work turned increasingly to arms production. In particular, new underground tunnels were built (by camp inmates, under atrocious conditions) to house production facilities, esp. for fighter planes. In 1944 vast tunnel systems were dug under the code name "Bergkristall" – especially for the manufacture of the new Messerschmitt Me-262 fighter plane, the world's first jet fighter plane to enter mass production. Also towards the end of WWII, the camp population increased and more nationalities were represented at Gusen. Initially, most inmates had been political prisoners from Germany, Austria and Poland, later also Soviet POWs, but in the last years of the war inmates from other camps closer to the frontlines were deported to Gusen and Mauthausen, many of them Jews. Eventually Gusen consisted of three separate camps and was larger than the main camp at Mauthausen. These camps were also amongst the deadliest. Of the over 70,000 inmates who passed through Gusen, more than half did not survive. The main causes of death were exhaustion, starvation and disease – but the camp guards also murdered prisoners, e.g. by the hideous method of "death baths" (immersion in ice-cold water). To cope with the large numbers of deaths, Gusen was soon equipped with its own crematorium – but towards the end of the war, even this installation's capacity wasn't sufficient any longer, so corpses were piled high inside and even outside the crematorium and the barracks. Like Mauthausen, the Gusen camps were liberated by the US Army on 5 May 1945 but the sites were then handed to the Soviet Union, in whose occupation zone this part of Austria fell. Unlike Mauthausen, the camp buildings at Gusen were nearly all demolished. Gusen is thus regarded as one of the vanished or even "forgotten" camps. 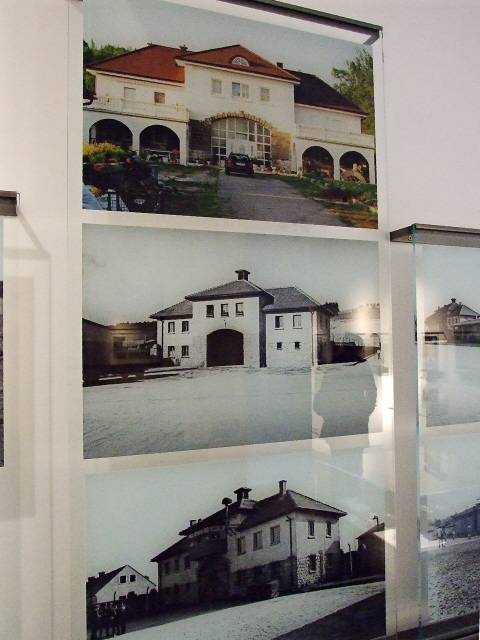 The few buildings that remained were turned over to other uses, housing businesses or even becoming private residences (including, remarkably, the former "Jourhaus", or main gatehouse which used to house the SS administration of the camp). The rest of the former camp's grounds were built over with new housing. Only the crematorium was saved from demolition by private initiatives who also saw to it being converted into a first memorial in the mid-1960s. Next to this a proper visitor centre was finally built and opened in 2004. So at last, at least some commodification has been provided for and offers some background information to visitors. In contrast to that, what remains of the underground former production tunnels remain out of bounds to visitors (unlike the one at Ebensee) – although endeavours to change this, or at least preserve what is left, are apparently under discussion (occasionally) … but the issue remains controversial. For the dark tourist, Gusen may (at least currently) be of only secondary importance, but as a controversial case of ways (or lack) of commemoration it is certainly a particularly interesting one. 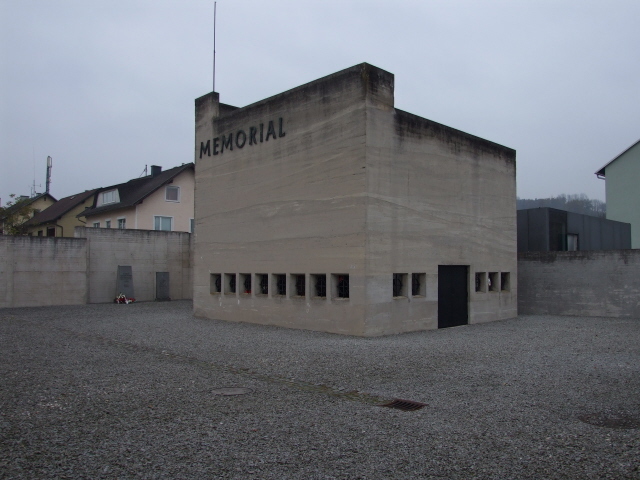 What there is to see: The main bit that remains of the "forgotten" camp of Gusen and the only one fully commodified for visitors is the crematorium memorial and new visitor centre next door, just off the main street between Langenstein and St. Georgen. 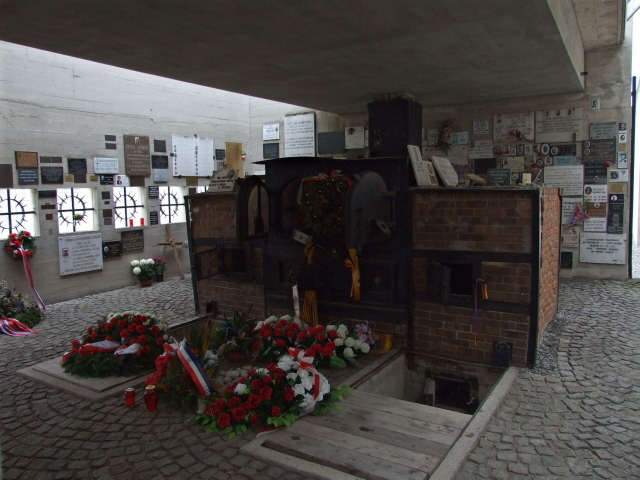 The crematorium's double oven is sheltered by a semi-open concrete shell. As you approach it, you can first only peek through "window holes" into the inner part of the memorial with the ovens and memorial plaques. Only if you walk all the way around the building will you come to the opening in the wall that allows access to the inside. Apart from the oven and the memorial plaques there's nothing to see, but the plaques include some interesting examples (e.g. there's one by an anarchist organization, which points out that the anarchists murdered at Gusen were killed for nothing but their wish for freedom and social justice without any form of authority!). The items left by the oven, many in memory of Italian victims, can also be noteworthy. 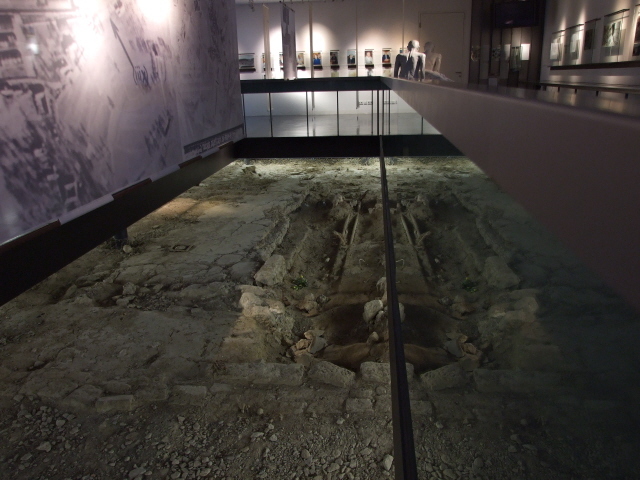 The visitor centre next door consists of a single large room that sort of "hovers" over archaeological remains of some camp building which you can see through an opening in the middle of the room's floor, thus forming the centrepiece of the exhibition. The individual parts of those remains are explained on text panels (otherwise you'd have no clue as to what you were looking at). 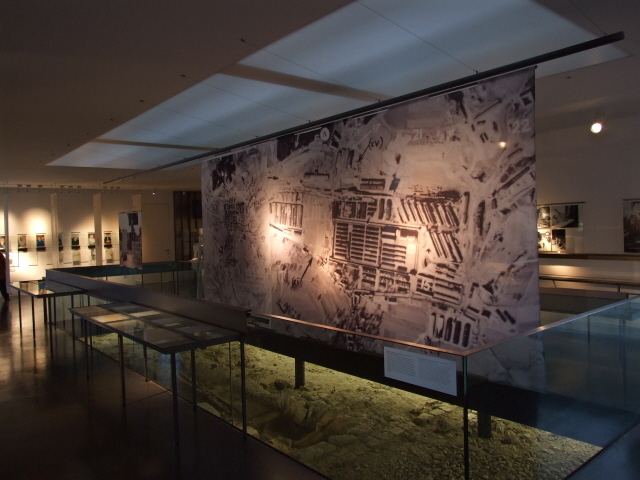 The other sections of the exhibition cover the camp's history, from construction and the system of forced labour up to the liberation and subsequent "disappearance" of the camp. There are lots of remarkable photos and explanatory texts in both German and English. At the entrance, a few publications, also about Mauthausen, are available, including the especially remarkable coffee-table-book-sized bilingual "the visible part – das sichtbare unfassbare". The walk will take you past buildings that once formed part of the camp complex, e.g. the former camp's brothel or the old gatehouse. The latter, remarkably, is now a private residence! Other buildings house businesses – and none are accessible inside. You can only walk around the streets of this seemingly peaceful and innocent residential area. If it wasn't for a few pointers/text plaques and the audio "guide", you wouldn't know that this was once the site of one of the most murderous concentration camps in the Third Reich. 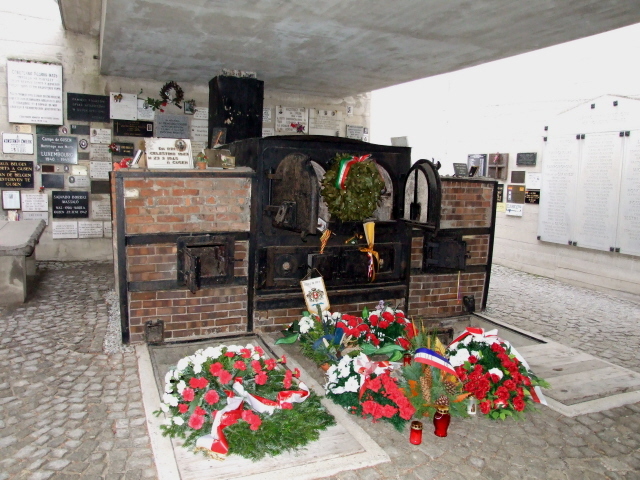 This makes the experience for today's visitor very different to that at, in particular, Mauthausen – which is only round the corner and should be visited in conjunction with the Gusen memorial/area. You need more imagination and guiding at Gusen (it's more abstract). Mauthausen, on the other hand, where a lot of the original structures have been preserved, speaks for itself much more (although extensive commodification is provided there too). Compared to Mauthausen, Gusen may thus be of only secondary importance to the dark tourist, but it's still a worthwhile add-on all the same. Location: at Georgstraße 6, in A-4222 Langenstein, Austria, between Langenstein proper and St. Georgen (the actual village of Gusen is the smallest of the three and therefore doesn't have its own postcode), about two and a half miles west of Mauthausen, and about 10 miles (16 km) from the centre of Linz. Access and costs: a bit off the beaten track, but quite easily reachable; free. Details: The crematorium memorial and visitor centre can be found right by the main road (Georgestraße) going through Gusen village between Langenstein and St. Georgen. You'll see the grey concrete shell above the old ovens that says "MEMORIAL" visibly enough. There's a small car park on site. To get there by car first take the main overland road No. 3 (Bundesstraße 3), which goes all the way along the Danube from Linz to Krems in the Wachau (where the S6/A22 connect onwards to Vienna) and also passes through Mauthausen village. Either take the exit for Gusen/St. Georgen itself, already called Georgestraße, or if coming from Mauthausen turn into Hauptstraße at Langenstein at the intersection with Linzer Straße (to Mauthausen village) and Wiener Graben (to the camp memorial and quarry). The Hauptstraße at Langenstein eventually yields into Georgestraße. To get to Gusen by public transport you can take the regional bus, e.g. line 360 (ÖBB Postbus), which goes from Linz central station ("Hbf.") to Perg and is the most convenient; or from further south in Linz (by the Voest industrial complex) line 379 (to Arbing West), which is slightly quicker. Get off at the stop "Gusen b.Langenstein Bachstraße", which is just a few steps from the memorial. The closest train station is St. Georgen, a bit over a mile north of Gusen (with connections from Linz) – you can check timetables at ooevv.at and oebb.at respectively. The crematorium memorial and the remaining former camp buildings can in theory be seen at all times (the latter only from the outside, as they are businesses or private residences these days), the opening times of the visitor centre are: Tuesdays to Sundays 9:30 a.m. to 5:30 p.m. (between 1 October and 31 March open only on weekends and public holidays, closed altogether between 24 December and 6 January). Audio guides for the "audio walks" can also be obtained at the Gasthaus Pree restaurant opposite the memorial site (i.e. also when the visitor centre is closed). Time required: The crematorium memorial and visitor centre take less than an hour (possibly no longer than 30 minutes), but the walk past all the other remaining vestiges of the camp will take significantly longer (esp. if done by way of the "audio walk" guiding provision, which is calculated as taking 95 minutes plus 25 minutes walking time back to the starting point). 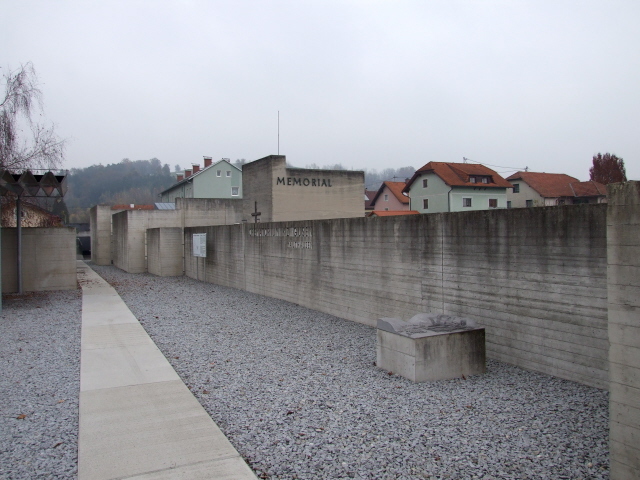 Combinations with other dark destinations: Obviously, it is practically obligatory to visit the much larger and much more commodified memorial complex at the main camp of Mauthausen when coming to Gusen. It doesn't matter much in which order, but bear in mind that visiting Mauthausen requires time, so if you want to do both in a single day, make sure you have an early start! Suggestions for more combinations further afield can also be found in the relevant section of the Mauthausen entry. Combinations with non-dark destinations: see under Mauthausen.